Been looking for a cz97 for a while and managed to find one localish to me. Looks like it has wood like grips and a nice glossy finish, only two magazines. Owner states less than 100 rounds through it. I realize it's not a total steal at 1000, but these are hard to find locally, and that blue finish is glorious. I'd probably be working it over with czcustom or cgw's parts and maybe shooting it CDP in IDPA or others. I realize the blue finish might not stand up to that as much as the poly would. I know of the barrel change and will be on the look out. Does it have front cocking serrations? Nice pick up either way. I got one about a month or so ago. I bought it used from a member here. When I was buying it I didn't care that it is a gloss blue model but when it showed up I am glad that it is. Side by side with my 75s the finish is just nicer. It came with the CZ aluminum grips and now has a set of blue/black LOK palm swells on it. yes it does, not sure about the barrel, but leaving to take a look at it now. I think it's a fair deal, not stellar, but then I don't think I'm losing my shirt either. I had to look back for what I paid for mine in mid-December. I bought it here for $800 but it had the trigger work already done on it. It does not have the conversion done on it. I haven't gotten it to the range yet and I only currently have ammo on hand that was loaded for 1911s at a major power factor. Not the earliest version but a good score. Shoot it first. It may feed anything. If it's strictly going to be a range toy, it should feed any round nose ammo. The blue ones do seem to bring more money. If you like and and think you did ok, that's all that matters. Here's what to look for on the barrel. New on the left, older version on the right. So it has the older style barrel....and came with two mags. One looks to be mecgar and the other looks to be for a large frame EAA witness. I believe they are reliable with the 97. I was able to talk down the price by a little. I am crossing my fingers that it handles hollowpoints reliably. Though admittedly, it's going to likely be a IDPA CDP gun, or a range gun. But as kinda an OCD thing, I want all my weapons to be capable of all ammo types. Good find. I have 2 cz97s. One of the older ones that is blued with wood grips and no fcs and one of the newer versions. You can also buy a new barrel for it with the longer feed ramp from CZ. Nice find, you wont be disappointed. I was looking for a Blued 97B but in California they are hard to come buy and when they do pop up they are not worth the extra premium, so I decided on a brand new one. 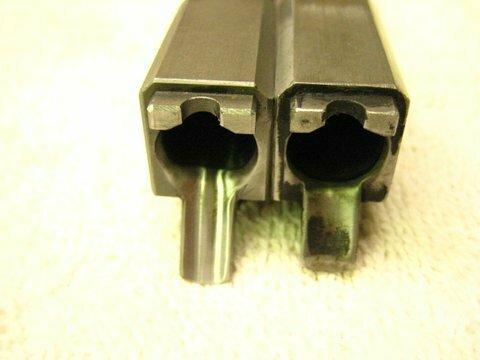 I plan to to the CGW Barrel bushing and leave the trigger and hammer alone. I use mine as range toy and bed side gun, don't need anything fancy, trigger is good enough. I also was thinking about getting the slide blued, then stripping the frame and leaving it naked or maybe doing a coating of the same color as the frame to have some protection. I saw a picture of another 97 done that way and it looked real nice. Not sure if I will ever get around to it though. Enjoy your new toy. I enjoy mine.